This '08 was well setup on AST 4200s, Vorshlag camber plates, custom swaybars, 18x9.5" wheels and sticky ST rubber (and R88s for track use). 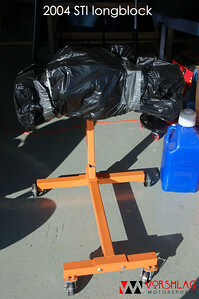 There's also a racing seat, COBB bits and pieces, even a custom after-cat exhaust I built. 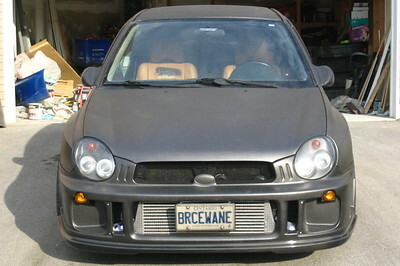 After a few "warranty issues" on the '08, with a little encouragement Paul decided to build a more serious autocross and track effort with a more dedicated and "replaceable" race car. By that I man an inexpensive Subaru chassis that is somewhat "disposable", so he's not running a $35-40K, nearly new, daily driven street car on track. It only takes one incident to really ruin your day. 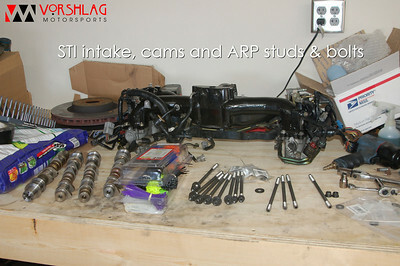 He had also picked up the transaxle, rear subframe/axle, fuel tank, brake/fuel lines, dash, interior and pretty much everything from a 2007 STI from another local racer who had totaled their car. 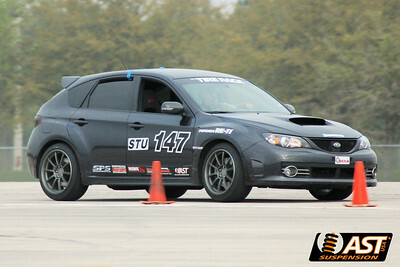 He still needs to source the motor but he has a hot lead on a 2004 STI motor and turbo. The entire STI drivetrain is going into the old FWD Impreza chassis with a custom harness that allows for full DCCD diff control, like the late model cars have. Its going to have the late model dash as well, which should look pretty slick. 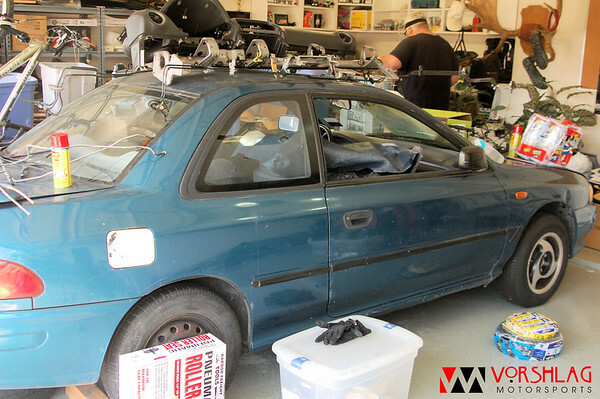 The car sat for a several weeks (with parts piling up on the roof!) 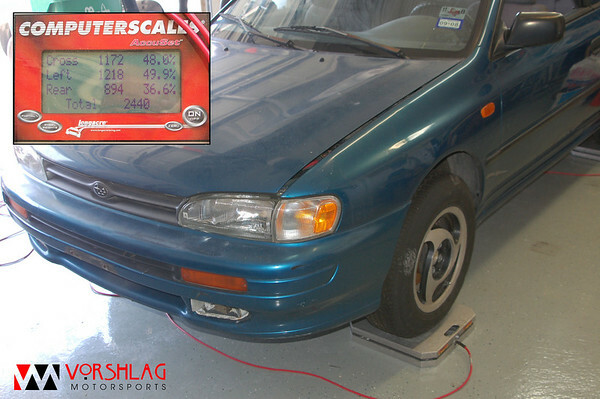 so I dragged my 4 corner scales by Paul's home garage to force him to remove the 100+ pounds of trash and dead bodies from the interior "to get a starting weight" on the car, and hopefully kick-off his build project. That worked. While I was there I noticed that his giant air compressor I helped him pick out almost a year earlier was still sitting, unused and un-powered. 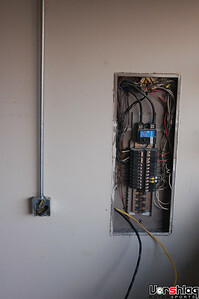 He still had no 220V circuits and outlet in his garage, and had almost no lighting or usable 110V outlets... typical track home with one outlet and one 60W bulb, but luckily it was a 3 car garage (the reason he bought this house), and as a bachelor he could do with it as he saw fit. In its current state he couldn't get any work done in there - in the dark without power or compressed air. One thing leads to another and we ended up spending the entire weekend adding lots of 110V and 220V outlets and fluorescent lights to his garage, moving all sorts of junk out of there, re-arranging the car, and more. It was hotter than hell outside (101°F) and even hotter in his attic, but at least now he can run his compressor, plug in some power tools, and have enough light to work (3 x 8' fluorescent lights). Last edited by Fair! ; 01-14-2014 at 07:59 PM. We've been both pouring over the rules for SCCA Solo Street Prepared and Street Modified, looking for changes and areas to maximize. Paul noticed that SP (and SM by default) now allows for full weld-in 8-point roll cages, which is a big change from before (it all had to be bolt-in style, before) and now he and I are both planning cages for our project auto-x/track cars. This will let us both run the cars in NASA Time Trials safely and still maintain SCCA Solo class legality (we've since decided to delay this for both f our cars). 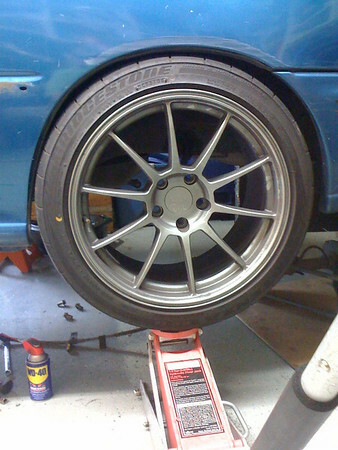 This is a TR Racing 18x9.5" wheel with 245/40/18 tire. 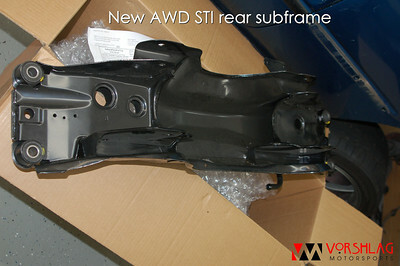 Its almost touching the inner fender sheet metal and is pretty much touching the outer section as well. So it would likely need some baseball bat rolling to fit this tire initially, which I think is the route he's going to want to go with. 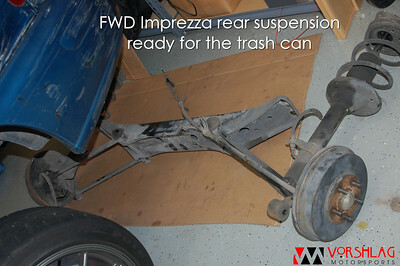 I keep telling him - get it together with the major parts initially, and worry about the tires/wheels last. This way he can get it running and driving and sorted using his HUGE selection of used ST tires and wheels, before blowing $3500+ on any custom wheels & tires (CCW?) needed for SMod. 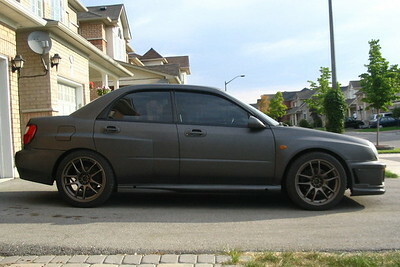 When its time for 18x10's its going to need flares, too. 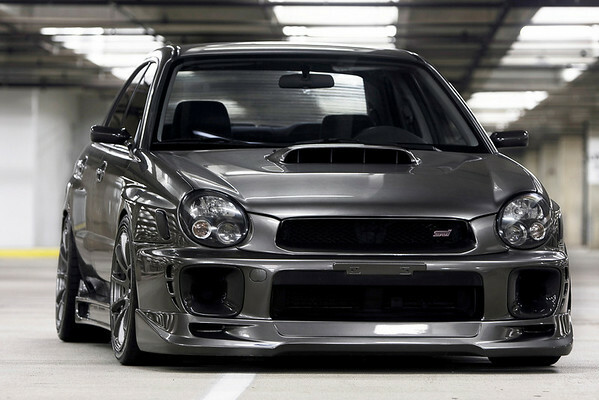 Personally I think the stock, 2 door GC8 STi look is pretty damn sharp. I think we can custom make flares that look good, maybe even similar to the profile in that picture, but just make them wider to clear the 285/30/18 tires. Last edited by Fair! ; 12-15-2010 at 05:06 PM. 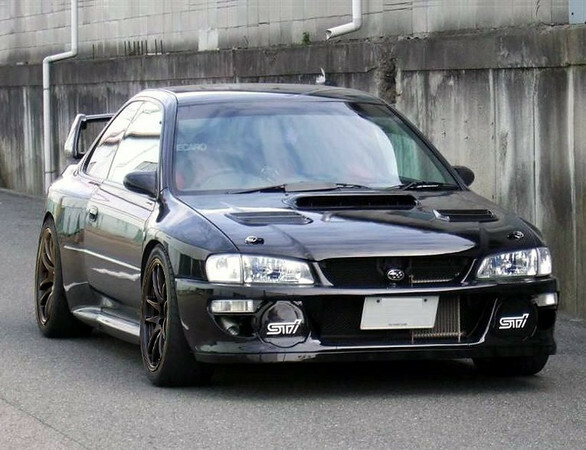 That is not a 'stock STi front bumper' It is either the STi Sport front bumper (can be purchased as an aftermarket part from STi, not an OE option) or a true 22B front bumper. Send a private message to GotCone? Find all posts by GotCone? Project Update for Oct 26, 2009: Not much to report yet. Paul has been piddling around with the car and after borrowing some tools to get some stubborn seat belt bolts (pinhead torx) removed last week. 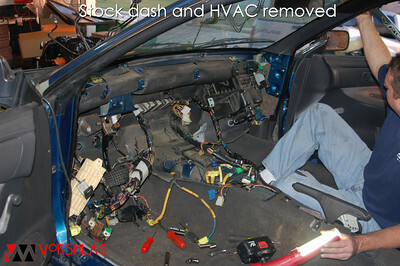 All he has left in the interior is the old dash to remove, then the new '04 STi chassis harness can go in, and the '08 STi dash can be trimmed and installed over that. Once that happens the rest of the interior starts to fall into place. Should? Last edited by Fair! ; 12-15-2010 at 05:10 PM. Unfortunately the project has been totally stalled out for the past 6 weeks, so he needed a "jump start" (literally!) to get going again. His old truck hadn't been started in 2 months and it was dead as a doornail. I dropped by with the jump box, we got it fired up, then headed to Henry's house to pick up the 2004 STI longblock (used for a core) that he had sold Paul. This will be dropped off soon at COBB Plano (actually it went to The WattShop), along with the new pistons, cams, ARP bolts and other assorted bits for reassembly. 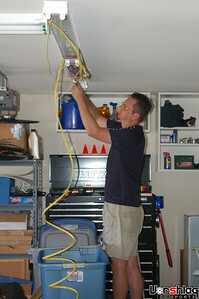 Paul's garage was a bit cluttered and hard to work in, so we started out by doing some cleanup. We also hung a new, ginormous "white board" and I made some "to do lists" for this project as well as 2 other vehicles he needs to sell. The old '95 front seats went in the truck to take to the dump, then we disassembled the rear subframe and suspension and it all went into the recycle bin (the steel). 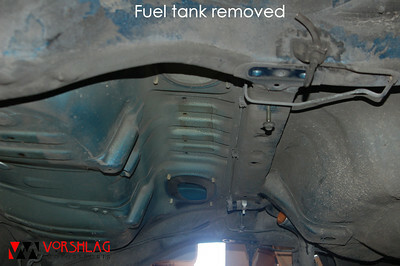 Next we pulled the stock fuel tank, which was a 2 man job since it still had 8+ gallons of old, nasty fuel inside. We managed to get it out and only cut one line, and didn't spill a drop. 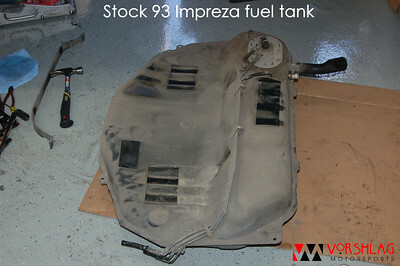 Once it was out we pulled the fuel pump/pickup/sender assembly and drained the contents into a 5 gallon bucket, then poured that into two 5 gallon fuel jugs using a cardboard funnel (reminder - go buy some damn funnels, Paul!). 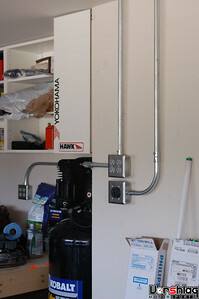 Then the tank was allowed to air out; later it will get recycled, too. The other big step planned for today that needed 2 people was the stock dash and main harness removal. 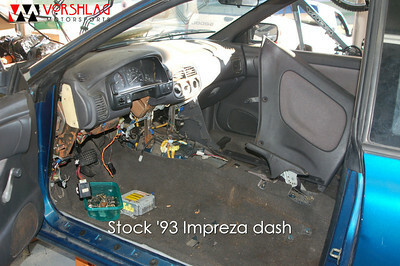 The stock '95 Impreza dash was coming out and a '07 STI dash is going back in its place. 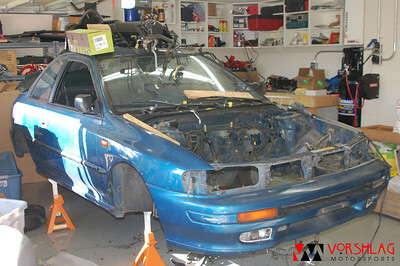 A wiring harness from an '04 STI is going to power the car and dash, or so the plan goes. 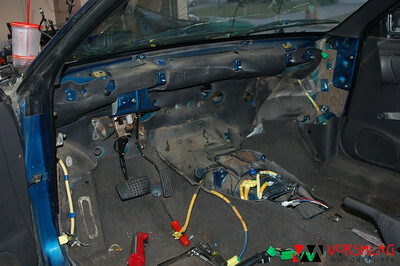 We removed dozens and dozens of screws, bolts and removed the old dash in pieces. The main support beam came out next, then the HVAC components came out in 3 separate sections - blower motor, evep coil and heater core. 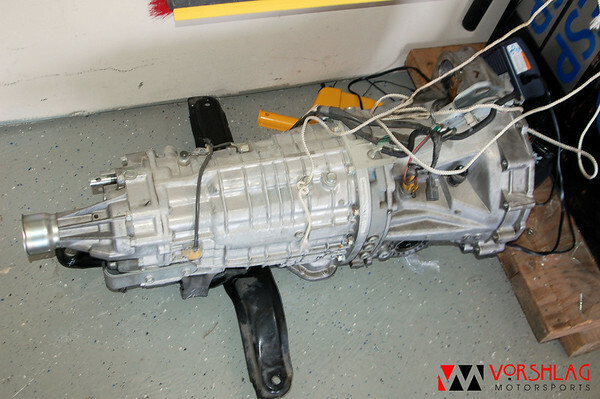 Next we discombobulated both the main dash/HVAC/circuit breaker harness and the engine harness, which ran from the dash area to the engine compartment in two separate runs. 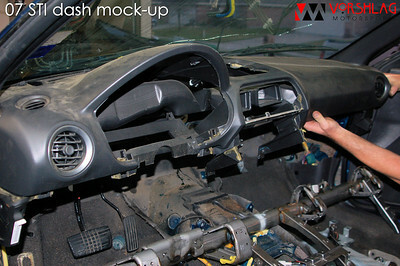 The '07 STI dash was then mocked up and its a really good fit. After some minor trimming it should "look factory" and will improve the layout and interior considerably, not to mention it will house all of the diff control switches and other differences between the '95 Impreza and an '07 STI. Lastly I showed Paul how to clean up a section of the underhood bud disaster area, using my top secret cleaning techniques. "We made a clean spot" so now he has to finish the rest. By day's end, a good chunk of work was knocked out and Paul is back on track, with plenty of sub-projects planned for the 2009 Winter Holiday break. Last edited by Fair! ; 12-15-2010 at 05:17 PM. Trying to schedule a bi-weekly work night for both Paul and McCall's cars. This Teusday Dec 22 = Paul's car! 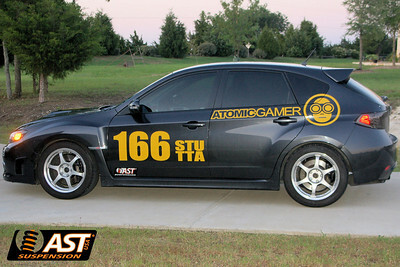 Yep, that is one of the cars that has inspired this project. 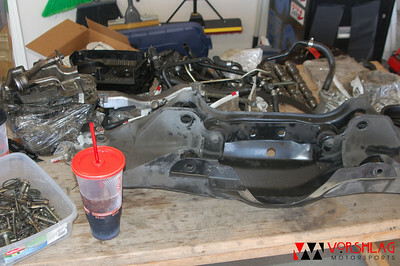 This Tuesday is putting in the new wiring harness (from the 2004 STi). I think this is the hardest part of the whole project, there are no directions. I will be starting at 6. Pizza order at 7.